Is your logic that you live by a valid one ? Whether it is about the little things in daily life or the biggest steps we take in life, we live by a motto or by a logic ! But did you ever question if that is correct. You can also apply this about all the things you read about on web and the news you see. Here is a sample ! This is a post on Arms License being denied based on religious discrimination in UP. Do you feel think if the logic is valid ? Here is how the reasoning should be ! 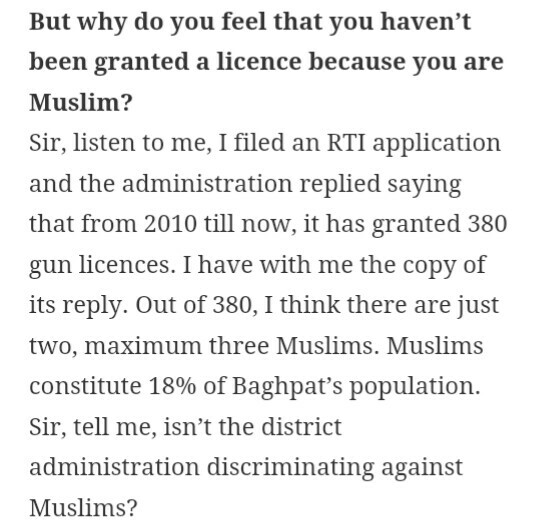 Irrelevant of the number of Muslims in a locality, the above logic is not valid to determine if there was any discrimination. The question to be asked is ≈Q1≈ how many applications were made in a year, from various religions & how many were sanctioned ? ≈Q2≈ What was the percentage (%) of rejection across religions, if at all that person feels there was any discrimination. Then based on the difference in percentage of rejection, the next question that needs to be asked is ≈Q3≈ Out of all the rejections in a year, what are the various reasons for rejection and how many rejections are made for each kind ? Based on that the next logical question and the determining factor is ≈Q4≈ out of the difference in percentage of rejection are there rejections based on same criteria which led to rejection in a certain group higher than other. After sorting those, you would need to improvise the percentage of distinct rejections based on the number of applications done. If you still find feel there is something fishy, you would need to see is ≈Q5≈ if there is any exclusive rejection applied to a certain group that has not been applied to the other one. You see I can go on like this, but now I hope you understand what I am trying to project here. There is some statement and there is a logic, but it is not validated. Don’t get carried away by the statements, statistics and news brought forward to you by media or social media. Before you forward any news or links, think if you consider that to be truth. What is the authenticity of the proclamation and whatever the logic is applied, if it is valid. Ask some questions.